To the same end, the picker wishing to process or package fresh wild mushrooms must obtain and maintain in effect the same permits as processing plants and meet the same requirements. In regard to health and safety conditions, handwashing is advised after using the toilet, smoking, handling a hydrocarbon canister, checking engine oil level, using a chain saw, blowing your nose, eating, etc. Between each expedition, the cloths used for harvesting are laundered; equipment and containers used for the harvest are cleaned and sanitized. Keeping a bucket of soapy water in one’s vehicle for washing hands and rinsing dirty cloths after each forest expedition; providing, depending on the type and quantity of the harvest, a second container to replace the first if the water becomes too dirty. Extend the fridge or shelf life of harvested fruit bodies. Clean mushrooms covered in a film of moisture (picked in the rain, the morning dew, snow or deep moss) must be completely dried by separating them (without piling them up) on a mesh tray in a refrigerated room or in the shade in a current of air (usually 30 minutes to 3 hours is sufficient). Drying is necessary because bacteria and mould can develop in the film of moisture. Certain mushrooms, such as Lobster Mushrooms, should be washed as soon as possible after picking and immediately placed to drain and dry, as previously described. 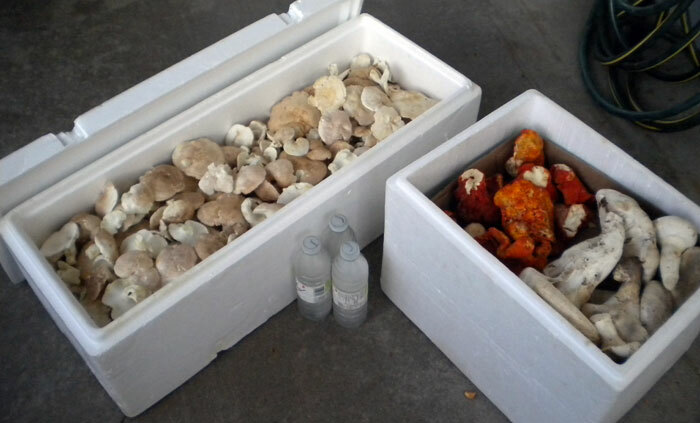 When the surface water has dried, the mushrooms should be refrigerated again. Delivery to the packaging plant always takes place in refrigerated conditions, either in a refrigerated vehicle or in styrofoam boxes that include ice packs or frozen water bottles. Early in the season, the picker makes a statement of harvest territory using the attached form. If harvesting outside this territory, the picker commits to separating the mushrooms and declaring the origins at each delivery.